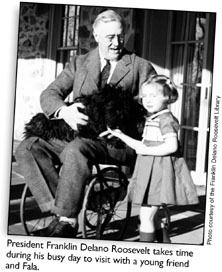 One of the most famous Presidential pets was Franklin Delano Roosevelt's constant companion, Fala. Fala, a Scottish terrier, was given to President Roosevelt by his cousin, Margaret Suckley, who thought that the pup would ease some of the President's stress during the difficult days of World War II. 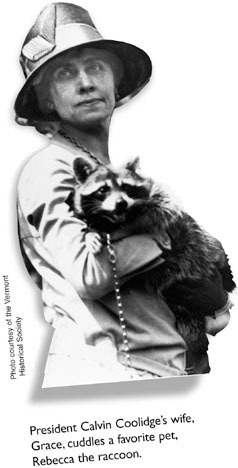 Fala's full name was Murray of Fala Hill after a famous Roosevelt ancestor. 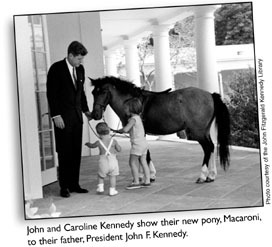 Fala almost never left the President's side. In fact, when Winston Churchill and President Roosevelt signed the Atlantic Charter in 1941 on the U.S.S. Augusta in the mid-Atlantic, Fala was right there with the two world leaders. And at the Franklin Delano Roosevelt Memorial in Washington, D.C., a statue of Fala sits next to that of his favorite companion, the President.